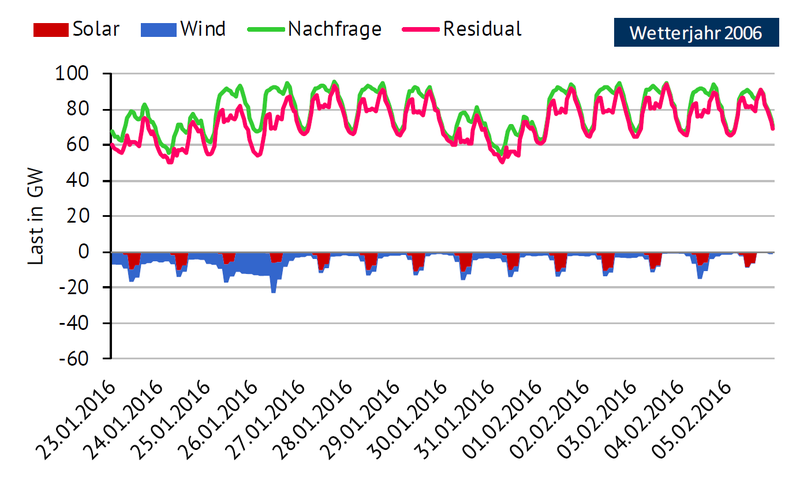 What can be done when it is dark (no solar power) and there is no wind either, but power demand is high? German analysts took a look at the worst combination in recent history – from 2006 – and found a way to bridge the gap. But is it affordable? Craig Morris’ main takeaway: The Germans know the Energiewende’s weak spot, and they have modeled it, modeled it, modeled it. Remember the Dunkelflaute (dark doldrums) – when there is very little wind and solar power? 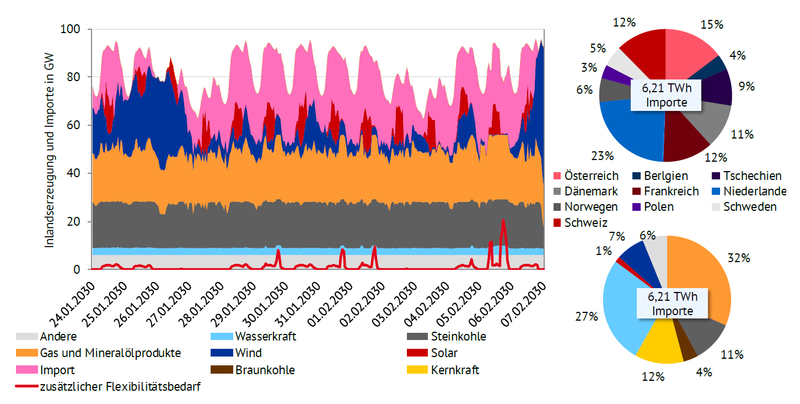 Energy Brainpool took a look at weather records to find the worst such case in recent history to investigate what they call the “cold Dunkelflaute,” when power demand is also high (PDF in German). 2006 started off with such conditions. In the chart below, the green line represents demand. 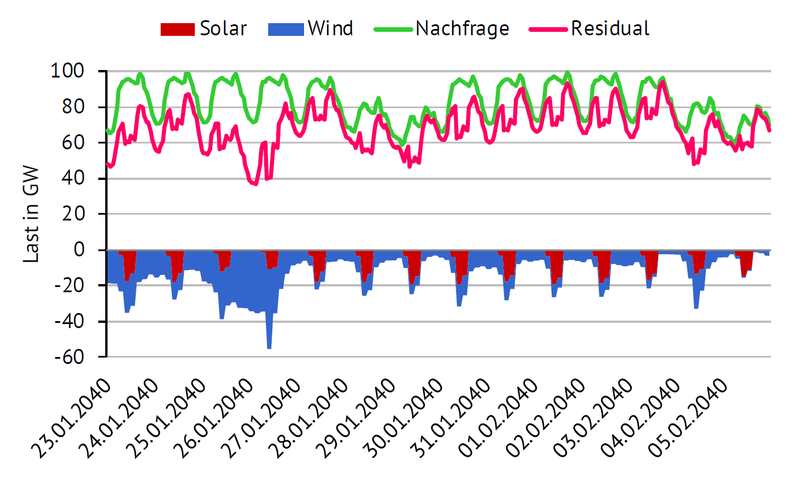 The residual load (red) is the amount of demand not met by solar and wind (shown below the baseline). As you see, there were nearly 2 weeks in which dispatchable plants had to cover practically all of the demand. Germany is obviously adding a lot more solar and wind, so Energy Brainpool investigated one scenario with 69% renewable electricity in 2030 (the official goal is 80% by 2050 and 50% by 2030) under the weather conditions of 2006. It doesn’t look much better for those weeks. The analysts reject the notion that there will always be wind power somewhere in Europe that can be imported. 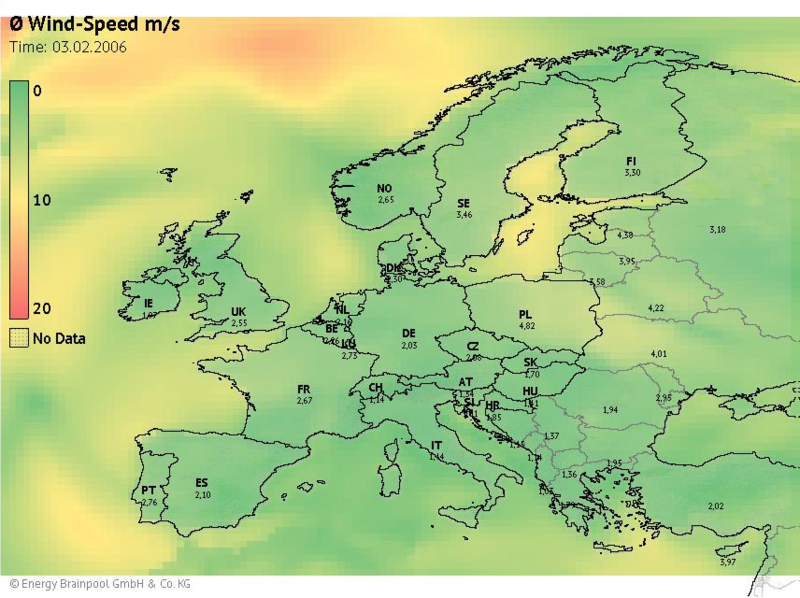 While stretching the grid across the continent will help in many cases, Europe is simply not big enough for the wind to always be blowing somewhere, as the map below of actual wind conditions on one of those days shows. The chart below assumes (left) that nuclear and lignite will have been completely phased out by 2030. The main three power sources at that point during a cold Dunkelflaute would then be hard coal, gas (partly biogas), and power imports – but wind won’t be available in large quantities from abroad necessarily. The two pie charts on the right show the breakdown of those imports by power source (bottom) and the country (top). The study then looks ahead to a scenario with 100% renewable power (by 2040). The solution they model is somewhat controversial as it involves power-to-gas (P2G). When the gas made from excess renewable power is converted back into electricity, the losses easily exceed 50%. Germany will essentially need a combination of seasonal storage of excess renewable power (that’s the P2G) along with power imports and demand shifting (flexibility) for “cold dark doldrums” lasting for up to 360 hours, equivalent to around two weeks. If you are looking for the Energiewende’s weak spot, look no further. To meet peak demand of around 80 GW, there would be significant overbuilding: 231 GW of solar at a capacity factor of around 12%, 190 GW of onshore wind (capacity factor (CF): 22%), and 39 GW offshore (CF: 36% – strangely, significantly below current levels). 67 GW of gas turbines would also be needed (CF: 20%) along with 42.7 GW of electrolyzers and some 42 million electric vehicles (roughly the number of cars in Germany today) to help with storage. All of this is exactly what critics of the Energiewende highlight: the overbuilding of capacity at low CFs along with inefficient P2G and assumptions about storage will lead to skyrocketing costs. But the study found that the electrolyzers (CF: 28%) would only make up 2% of total power supply in this scenario. And the cars are there anyway. Aside from the price, the finding is not particularly new. Among others, the Kombikraftwerk study investigated the “dark doldrums” in a scenario with 100% renewable power – and found it to be manageable, also with lots of P2G. And I have said before (such as in 2013) that Germany will always need dispatchability roughly at the level of its annual peak demand. With each new scenario, that seemingly daunting future is looking more affordable.